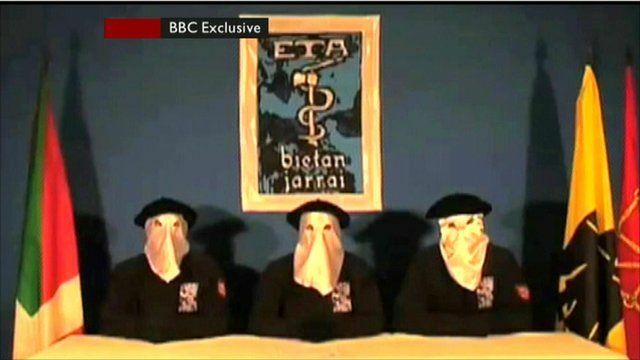 Eta announces ceasefire Jump to media player The armed Basque separatist group Eta has decided not to carry out "armed actions" in its campaign for Basque independence from France and Spain, the BBC has been told. Spain's Eta 'ceasefire' reaction Jump to media player Inaki Soto from Basque Country newspaper, Gara, said the community would welcome Eta's ceasefire announcement. The armed Basque separatist group Eta has decided not to carry out "armed actions" in its campaign for Basque independence from France and Spain, the BBC has been told. Clive Myrie's reports includes exclusive footage given to the BBC, of the ceasefire announcement.